(Middletown, CT.) Chairman Gregory Shook of the Middlesex County Chamber of Commerce announced that Lawrence “Larry” Riley of Middletown has been named the recipient of the chamber’s 2016 William J. Pomfret Veteran Community Service Award. 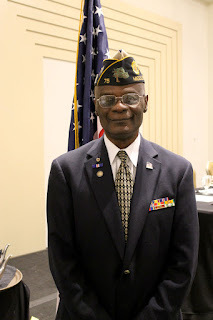 The William J. Pomfret Veteran Community Service Award is presented annually to a Veteran of the United States Armed Forces, in recognition of his or her distinguished service to the citizens of Connecticut and selfless commitment to public service. The William J. Pomfret Veteran Community Service Award will be presented on Monday, November 7, 2016 at the 15th Annual Support the Troops and Honor the Veterans Member Breakfast Meeting. Captain Paul Whitescarver, Commanding Officer, Naval Submarine Base New London, will serve as keynote speaker. The Member Breakfast Meeting, sponsored by Middlesex Hospital, will be held at the Radisson Hotel Cromwell, 100 Berlin Road, Cromwell, CT, with networking beginning at 7:00 a.m., breakfast buffet opening at 7:30 a.m., and the meeting program, 8:00 to 9:00 a.m. Advance registration required, please register online: www.middlesexchamber.com. For more information, please visit www.middlesexchamber.com. The 2016 recipient is Lawrence “Larry” Riley of Middletown. Larry Riley was born and raised in Middletown, CT. He graduated from Woodrow Wilson High School in 1965. His first job after high school was at Remington Rand in the north end of Middletown where he apprenticed and worked as a Univac Ribbon Inker. While working at Remington Rand, Larry signed up for the “draft” and was deemed 1A meaning he was available for military service. Larry decided to enlist in the United States Air Force to which he made a four-year commitment. On March 15, 1966, he left Middletown for Air Force Boot Camp in San Antonio, Texas. Larry’s first assignment was at Altus Air Force Base in Oklahoma as a Security Policeman for 25 B-52 Bombers on alert status. While at Altus, Larry attended and graduated from the traveling Combat Sentry Dog Handler School which is an initiative of the Department of Defense. His first dog was named Thor. To escape the racial tensions that gripped the area in the mid-1960s, Larry volunteered for service in Vietnam. On December 12, 1966, Airman Riley and Thor departed Texas with 29 other dog teams for a two day trip, 40 hours of flying time, trip to Saigon, RVN. After a short stay in Saigon, they were diverted to a new American Air Base, Phu Cat (Fu Cat), located in the central highlands of Vietnam, south of Da Nang and southeast of Hue City. Larry spent 19 months at Phu Cat. While there, he received a new dog named Smokey and together they defended the Air Base from several ground attacks including The Tet Offensive in 1968. Larry received recognition for his actions with the Air Force Commendation Medal and a Presidential Unit Citation Award. After Vietnam, Larry served at Castle Air Force Base in Merced, California, and Forbes Air Force in Topeka, Kansas. Larry attained the rank of Staff Sergeant (E-5) before he reached three years in the U.S. Air Force. He served from March 15, 1966 to 1970 when he was Honorably Discharged. Larry returned home to Middletown, CT. and began working security for the State of Connecticut at the Whiting Forensic Institute in Middletown. He worked his way up to Assistant Chief of Security and began to look for other professional opportunities. In 1974, Larry applied for the United States Secret Service. After waiting out a job freeze, Larry was sworn in on January 12, 1976 and began his training immediately. In 1979, he was promoted to the Technical Security Branch and was trained as a handler and as half of an Explosive Detector Team. His partner was an 80 pound German Sheppard named Tanna. After Tanna’s retirement, Larry began to work with another dog named Mack. These dogs could sniff 130 types of explosive devices and were extremely valuable. Larry was assigned to the Secret Service Advance Team, and he and his team had to complete their comprehensive search of the area before the “Protectee” arrived on site. Larry worked for four Presidents of the United States including Gerald Ford, Jimmy Carter, Ronald Reagan and George H.W. Bush. Larry has been to every state in the union along with Mexico, and during the Reagan Presidency, Larry traveled to the president’s Rancho del Cielo in Santa Barbara, California 74 times in eight years. Larry also protected Princess Diana when she visited the United States. After a successful career with the U.S. Government, Larry remained in the D.C. area where he worked as a security advisor and dog training instructor for select clients. In 2004, Larry married the love of his life, Elisabeth Petry of Old Saybrook, and moved back to Connecticut to be with Liz. Larry Riley has engaged in a number of veteran support initiatives throughout his long and distinguished career. He served as Commander of the Veterans of the Vietnam War for five years and served two one-year terms as Commander of the Middletown Council of Veterans Organizations. Currently, he is the Commander of American Legion Post 75 where he is about to begin his third year. Larry is also an officer in the Veterans of Foreign Wars and the Veterans of the Vietnam War. Through the Veterans Administration, Larry is training pound and shelter dogs to be companion dogs for Veterans suffering from PTSD, TBI, and other ailments that often lead to isolation. Larry Riley and previous William J. Pomfret Veteran Community Service Award recipient, Michael Rogalsky, were honored by the Hartford Courant for their work connecting school children with Veterans in the community. Larry and Mike coordinate visits from Veterans to the schools and help students learn about what it means to be a Veteran. Larry has been active in the community by serving on St. Luke’s Board of Trustees and by supporting a number of other initiatives. While serving at St. Luke’s, Larry assisted in starting the Vets4Vets program, and currently serves on the program’s Advisory Committee. Vets4Vets provides rides for Veterans to local appointments and provides intake services for the Veterans being served. He serves on the Board of Trustees and Building Committee for the Greater Middletown Military Museum, the Building Committee for the Middletown Community Senior Center, the Middlesex County Chamber of Commerce Support the Troops & Honor the Veterans Committee, the VA Commissioner’s Veterans Service Organizations Advisory Committee, the Board of Trustees for Indian Hill Cemetery in Middletown, and is a member of the local Community Emergency Response Team. Larry is also an active poll checker for the Registrar of Voters in Middletown, and leads the Pledge of Allegiance at every Middlesex County Chamber of Commerce Member Breakfast Meeting. Larry has participated in the last five Naturalization Ceremonies at Middletown City Hall, and at the last two, he proudly led the new American citizens in reciting the Pledge of Allegiance for the first time as new citizens. Finally, Larry is Co-Chairman of the Vietnam Veterans 50th Anniversary War Mural which was unveiled on September 27, 2016. Larry currently lives in Middletown with his wife, Liz. The Middlesex County Chamber of Commerce is proud to present the 2016 William J. Pomfret Veteran Community Service Award to Lawrence “Larry” Riley. Past Recipients of the William J. Pomfret Veteran Community Service Award: 2003-C.J. Larry Marino, 2004-Robert Wamester, 2005-Jack Monahan, 2006-Philip Cacciola, 2007-Arthur Lerner, 2008-Richard Anderson, 2009-Ronald Organek, 2010-John Krasnitski, 2011-Peter Galgano, 2012-William Currlin, 2013- Jeremiah T. “Jerry” LaMark, 2014- Norman Hanenbaum, 2015- Michael Rogalsky.